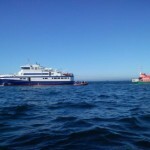 The 45 meter long ferry Fromveur II went aground near Trois Pierres off the island of Molène, France. The ferry was proceeding toward the island with 365 passengers and 8 crew in dense fog when it struck the rocks near the navigation channel. The Fromveur II attempted to pull itself free, but the tide had rolled out. 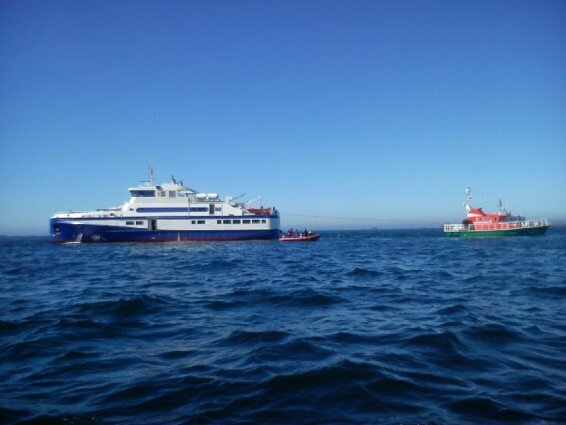 The crew contacted authorities which dispatched two SNSM lifeboats to the scene along with multiple helicopters. 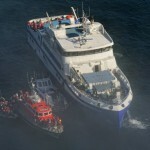 All passengers were safely evacuated to the shore. 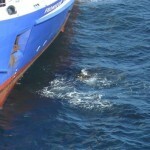 Divers inspected the Fromveur II for hull damage. They found a 40 centimeter hole near the engine room. The vessels pumps were able to control the flooding. No reports of any pollution released. 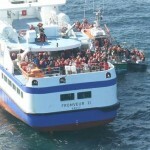 The SNSM lifeboats were able to refloat the ferry with the rising tide. The vessels were able to proceeded to Molène. No reports of injuries.